In a county famous for its support of local food, the uproar over lifting Marin’s ban on local slaughter raises questions about sustainable food policy. One vision of a progressive food system celebrates diverse local farms and an approach to meat production that reduces the suffering of animals eventually slated to be slaughtered. But another vision insists that animal slaughter will never expunge its inherently inhumane nature, and that only plants should feed a growing global population. Which is more progressive? And which is more sustainable? In many communities, food activists are too busy combating new concentrated animal feeding operations (CAFOs) or looking for alternatives to large-scale commodity crop production to debate the finer points of niche issues like local animal slaughter. That’s not the case in Marin County, California, a stronghold of the organic and local food movements, where a recent choice by the county board of supervisors to allow small-scale local animal slaughter has fueled a fight over the meaning of sustainable food policies. To some locals, the reversal of the ban on all animal slaughter that the board enacted in 2003 adds another positive chapter to the county’s storied local food ethos. “If you do not encourage the model of more local, sustainable, transparent food systems, then you’re going to end up with Monsanto and Swift and the large conglomerates producing food in a manner that is unhealthy and environmentally completely inappropriate,” said Mark Pasternak, a rabbit farmer and the owner of Devil’s Gulch Ranch. But to others, the very phrase “sustainable meat” is an oxymoron, an impossibility. By permitting any animal slaughter—even the small-scale, local kind—Marin County is regressing and papering over the sins of animal agriculture, they say. The change in the code, unanimously approved by the board of supervisors last month, allows small-scale slaughter of poultry—less than 20,000 birds or rabbits per year—and permits mobile slaughter units for all kinds of animals, including cows, pigs, and poultry to visit farms. The county won’t be inspecting slaughter operations, said Jeremy Tejirian, a planning manager for the county, although the USDA inspects all slaughter units for cows and pigs, including the mobile units that Marin is now using. Marin County had considered allowing brick-and-mortar slaughterhouses, but decided against it. Officials also thought about retaining a rabbit slaughter ban when some residents protested the killing of animals that are also popular household pets, but ended up lifting it as well. Supporters say lifting the ban will allow them to keep a great portion of the meat supply chain local, while also growing new aspects of their businesses. The rule change also highlights the limited number of options for small farmers everywhere, even in a place like Marin County, where there exists both demand for and supply of locally raised meat. Previously, farmers and ranchers had to send their animals to sometimes far-distant slaughterhouses for processing. Some Marin poultry farmers send their birds to Stockton or Sacramento, nearly 100 miles away. And though the nearest beef processing plant is just over the Sonoma county line to the north of Marin, minimizing or eliminating animal transport is key to humane treatment of poultry and livestock. And that Sonoma County slaughterhouse has taken over the operations from Rancho Feeding, which earned notoriety after employees admitted to slaughtering diseased and uninspected cows, leading to a federal recall of 8.7 million pounds of beef. Fifty years ago, there were about 10,000 slaughtering facilities scattered throughout the United States. Then in 1967, Congress passed the Wholesome Meat Act, which mandated that state slaughter rules be at least as strict as federal ones. The act ended up driving major consolidation in the meat processing industry, and today, there are fewer than 3,000 slaughterhouses throughout the country. Federal inspections are required for all large animal slaughter operations, and for poultry slaughter operations that process more than 20,000 animals per year. State regulations govern smaller poultry operations, and in California, only county rules cover poultry operations slaughtering fewer than 5,000 animals per year. Across California’s 58 counties, rules regulating animal slaughter vary considerably, with urbanized areas generally having stricter limits, said Dave Runsten, the policy director for the Community Alliance with Family Farmers, a California advocacy group. People on both sides of the issue hold strong opinions. Miyoko Schinner, an author, vegan chef, and animal rights activist based in Marin takes issue with the growing local, grass-fed beef movement. When applied to meat, terms like “local,” “humane,” and “farm-to-table” are just catch phrases that obscure the reality that meat will never feed the 9 billion people projected to populate the world by 2050, she said. On the other hand, humane meat advocated say that allowing on-farm and small-scale animal slaughter enables farmers of pasture-raised chickens to retain more control over their product. It’s also a more humane alternative to industrialized slaughterhouses, in which dozens of chickens stream by on an assembly line every minute, making inspection difficult, Runsten said. Additionally, there’s a bottleneck in the local food supply chain under current practices as farmers end up having to reserve slots in slaughterhouses months ahead of time, said Pete Kennedy, who is on the board of directors for the Farm-to-Consumer Legal Defense Fund, which advocates for less restrictive regulations on raw milk and small-scale animal slaughter. On-farm slaughter will help relieve the holdup. Allowing local, on-farm slaughter “is really just a chance to improve the local infrastructure and better meet the demand for locally-produced meat,” said Kennedy, whose group is advocating for legislation that would legalize the sale of custom-processed meat. In addition, unspoken don’t-ask-don’t-tell animal slaughter practices common in California leave farmers in legal limbo, said Pasternak of Devil’s Gulch Ranch. Better to explicitly approve slaughter, as Marin County has now done, he said. Pasternak also pointed to aesthetic benefits of lifting the ban. Farms are commercial enterprises, and dirty, sometimes noisy activities—such as slaughtering animals, spraying fields, and driving tractors—are necessary to retain the open space Marin residents cherish. Many wealthy people in the area near his farm “want to look at nice green pastures with a cow, but don’t want any commercial activity with smells or sounds or dust,” Pasternak said. But in Marin County, some residents worry animal slaughter could harm the local economy. “I think it has the potential to be an unmitigated disaster,” said Jon Haveman, an economist in Marin County. He said he doesn’t oppose all animal slaughter and just believes it needs to be done in more suitable places with fewer tourists and residents. Declining residential property values could threaten the county’s budget, he said. Tourism could decline. Additionally, he worries about water use in a drought-prone area. Slaughtering requires large amounts of water–130 gallons per cow, and five to 10 gallons per chicken–and the guts and offal have to be disposed of lest predators cart them off. 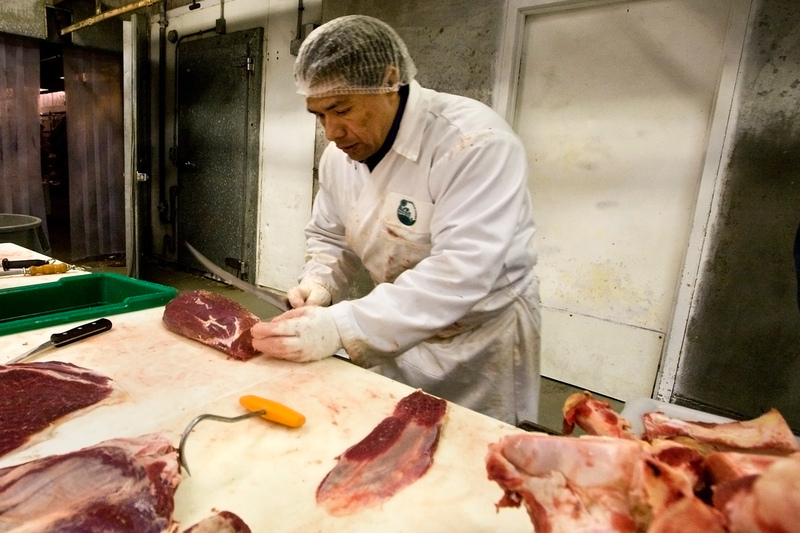 Less stringent inspection rules for smaller slaughter operations could lead people to cheat. Some people in Marin County are already plotting legal recourse. “There are people looking at it pretty aggressively, and I’d be pretty surprised if there was not legal action brought,” Haveman said. Marin Sun Farm photo CC-licensed by Carrie Cizauskas. Nah, trucking in water where there's no ground water...or pumping up deep ground water is more sustainable...and of course there's no potential erosion farming on sloping hillsides...oh, yeah and growing season last all year plus soils never get depleted. Never ceases to amaze me how ecologically illiterate so many of the more vociferous vegans (especially activist likes the vegan chef quoted above in this article) are...They seem to think all land is the same and interchangeable. ..whereas the reality is a lot more land is suitable for grazing than is suitable for growing plant foods. So if you want to truly feed as many people as possible, you utilize more land appropriately rather than limit yourself to the approximately 12% (on average) of the earth's land mass that's arable. Fantastic news. Keep our food local. Don't subject animals to long, cruel hauls just so we don't have to face the fact animals are killed for our consumption.